I believe that if we tune into our body wisdom we will choose food that our body will find nutritious and delicious. This may sound indulgent in our busy lives, but if you have time experiment and see what your body chooses. I pause for a moment and check in with my body (I would do this sat in my car if I am about to go shopping, it stops the weird looks!) Does it have any special requests? May sound weird but give your body a voice, see what pops into your mind. 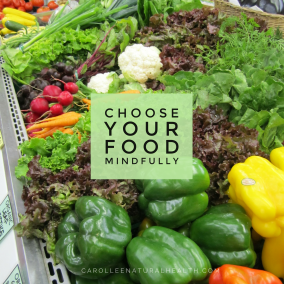 When you are in your garden, cruising the market stall or the fruit and vegetable aisles in the supermarket notice what you are most drawn to? This is best done when we aren't hungry; hunger puts our bodies into survival mode and screams at us to get a quick fix, this primitive response can override the quieter more subtle voice of our body wisdom. Notice if your body requests follow a particular theme such as always wanting greens or citrus fruit for example. Play, have fun with it, our body is always wanting to communicate with us. Spring Cleaning – Inside and Out!